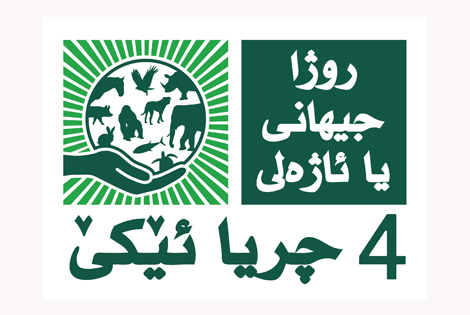 As you will know if you have read about the World Animal Day Grant, in October last year Naturewatch Foundation was delighted to award the 2016 grant to the Kurdistan Organisation for Animal Rights Protection (KOARP) led by Dr Sulaiman Tameer Saeed. The Kurdish people have suffered many years of persecution and bloodshed but, after decades of dictatorship, they are now beginning to benefit from living in a democratic society. Sadly, during all those years, the welfare of the region’s animals was largely forgotten, but we now have a wonderful opportunity to educate thousands of people who make their living from working with animals in markets, pet shops and abattoirs. The first phase of the project began in early January and is focusing upon addressing the barbaric treatment of animals in abattoirs. Dr Saeed and Dr Ahmad are raising the skills of the workers through talks, presentations, videos and practical workshops, and improving conditions for the animals at abattoirs throughout the region. Each worker who completes the course successfully is presented with a ‘Certificate of Competence’ by KOARP which confirms they have gained the knowledge and skills required to demonstrate competence in the slaughter of animals. We’ve heard from Dr Saeed that the first training courses are being conducted in the districts of Bardarash, Zakho, Aqra and Duhok and feedback has been excellent. It’s heartening to hear that the training is being so well received by the management and workers. We can’t change the past but we can change the future!